The Malaysia furniture industry has climbed to the first 10 export countries in the world ranking for the furniture market. This is a big success, achieved step by step in the last 20 years, thanks to the huge offer of different kinds of timber and to the capability of the malaysian furniture production, developed today into a mature industry from the humble cottage industry of the '80s. In June 2015, Malaysia’s current average furniture export value is RM 8 billion annually, and it is expected to increase to RM 16 billion by the year 2020. To maintain and improve this world ranking, today the Malaysian industry is focussed on the development of the culture of design, to transform its companies from "OEM" (Original Equipment Manufacturer) to "ODM" (Original Design Manufacturer) and "OBM" (Original Brand Manufacturer). 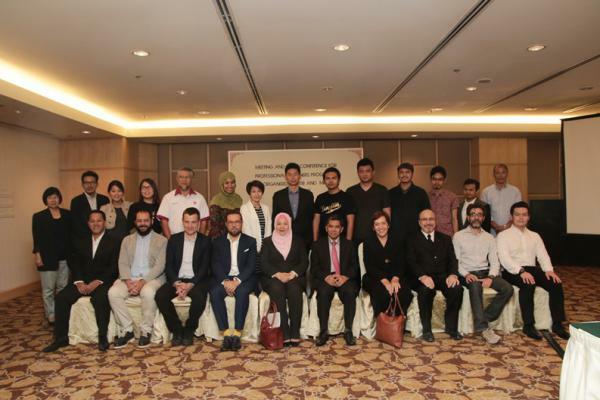 The first pilot PDP program is with the Malaysian Timber Industry Board, and it started on June, 29, 2015; it will end on spring 2016 with the first exhibition of prototypes during EFE 2016, in Kuala Lumpur, and other international shows (to be defined). This program will be a pilot project for 2015/2016 and it will be repeated annually as part of the Ministry of Plantation Industries and Commodities’ (MPIC’s) efforts in producing high-quality products with Original designs. 12 local furniture designers mentored in furniture design entrepreneurship by the 4 Professional Designers. This first edition of the PDP involves 4 Malaysia Pride recipients manufacturers, 4 international professional designers, 8 designers coming from the Tanggam program and 4 in-house designers. The companies will pick 5 designs - 2 each from the Professional Designers, 1 each from the Tanggam designers, 1 each from the in-house designers company, for a total of 20 to be prototyped and exhibited. All of the new prototypes designed by the Tanggam designers and by the in-house designers will be overviewed by the international professional designers, who could apply their experience to coach the Tanggam designers and the in-house designers from the very first concept to the finalization, to manufacture prototypes for the exhibition. The leading thread of the PDP program is the creation of new products, based on the use of local materials. These new prototypes will become new products, sold through regular sales channels, with new marketing strategies, focussed on design added value, characterizing the products as "Designer products". The four Malaysia Pride companies participating to this program aim to enhance their products, to widen and raise up their market. By cooperating with international designers, Malaysian manufacturers are going to improve the quality of design, involving the appearance of the products, as well as the process of streamlining the development and manufacturing. Madam Sarimah Sabudin, CEO at Malaysia Furniture Promotion Council, so commented: "The PDP program will be a journey of both learning and discovery. It will be a journey of learning about the the processes of Designing, the elements for Designs, and the stories that can be told through Designs. It will be a journey of discovering about our own local talents and our abilities as both Designers and Manufacturers. We will discover or re-discover our strengths, our creativity, our passion, our cultural diversity, and many more other great lifestyle qualities. These are the qualities that makes for a good furniture design." The four designers taking part to the pilot program have been selected among a pool of european designers, and possess an impressive background in furniture design and production. Giorgio Biscaro, Manolo Bossi and Filippo Mambretti are from Italy; Stefan Schöning is from Belgium. The 4 Malaysia Pride companies taking part in the PDP pilot program are Deep Furniture, Dynamic Furniture Industries, Tawei Furniture and Zone Furniture. The 8 Tanggam designers involved in the PDP pilot program are Mohd Shahrul Anuwar, Mohd Sujak Hasbollah, Addy Putra Zulkifli, Mohd Hazmi Zakaria, Stephen Ting Eng Poh, Sim Chia Yi, Nasaruddin Shah Morani, Stephanie Ng Hui Sien. This programme has been developed through the assistance of Italian Consulting Pte Ltd (ICON).